Argentina was one of Spain's colonies with the Americas. Spain king, Ferdinand VII. Spanish conquistadors and developed by the Monarchy of Spain through its administrators and missionaries. The motivations for colonial expansion were trade and the spread of the Christian faith through indigenous conversions. It lasted for over four hundred years, from 1492 to 1898. Beginning with the arrival of Christopher Columbus in 1492, over nearly four centuries the Spanish Empire would expand across; most of present day Central America, the Caribbean island, and Mexico; much of the rest of North America including the Southwestern, Southern coastal, and California Pacific Coast regions of the United States. Though inactive, with claimed territory in present day British Columbia Canada, and U.S. states of Alaska, Washington, and Oregon. Also, the western half of South America. The revolutionary movements in the early 19th century resulted in the independence of most Spanish colonies in America, except for Cuba and Puerto Rico, given up in 1898 following the Spanish-American War, with Guam and the Philippines in the Pacific. 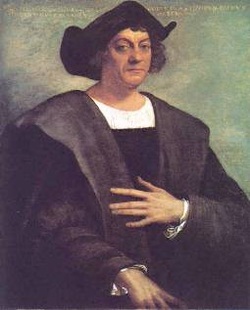 He is Christopher Columbus, who founded the Americas. He took himself to the south of Spain and while meditating an appeal to the king of France, opened his plans to the count, from 1491, of Medina Celi. The latter gave him great encouragement, entertained him for two years, and even determined to furnish him with three or four caravels, to carry out his great design. Queen Isabella of Spain supported him to do his plan, the voyage. He said that all the lands which he found would be Spain's territory.